Emphasis at Lebala Camp is on the animals. You have come to Botswana to see big game and at Lebala they make sure you see it. The Kwando Concession is renowned for large numbers of Elephant and Buffalo as well as plenty of antelopes and predators. Game drives are done with both a driver and a tracker, to maximise the animal-watching potential. Excellent general game abounds on the broad plains, creating spectacular scenery, adorned with herds of plains game and the ever-attendant predators. 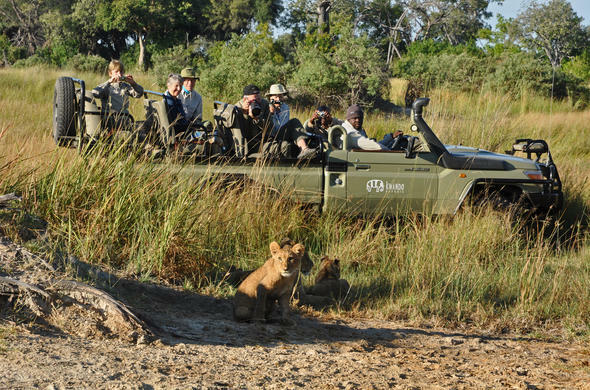 Lebala offers regular and reliable sightings of Elephant, Lion, Wild dog, Leopard, Cheetah, Giraffe, Zebra, Tsessebe, Kudu, Lechwe, Impala, Wildebeest and Waterbuck in stunning settings. Lebala is famous for Elephant sightings as is neighbouring Lagoon camp, 2 hours drive north. In fact the Kwando concession is home to more Elephant than the entire country of South Africa. Lebala complements the Kwando Lagoon experience by offering a spectacularly different setting, scenery and experience from that offered by Lagoon. Our guests staying at both camps have enjoyed game drives, including night drives, in vastly different settings and enjoyed fishing and boat cruises on the Kwando River from the shady Lagoon Camp. Therefore the ideal Kwando experience will involve stays at all the camps. Experience at first hand the art of survival in both prey and predator. Learn how Elephants locate underground water in a seemingly inhospitable terrain.